John Curtin leads Australia, which grows and thrives in territory where other civs would have difficulty, by getting full Housing from coastal starts. Their districts get improved yields when built in attractive terrain. John Curtin provides bonus production to Australia when they have been the target of a declaration of war, or have liberated a city. This pack also includes the new “Outback Tycoon” scenario: can you accumulate your fortune by striking gold, creating massive herds of livestock, or by preserving this land's natural beauty for future generations? 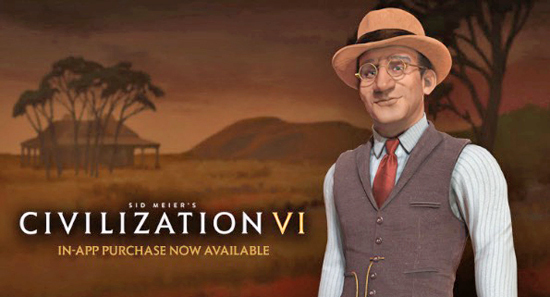 This DLC pack requires the full, unlocked game Sid Meier’s Civilization VI on iOS in order to play, which is currently on sale for 50% off in the App Store. Civilization VI is regularly priced $59.99. Sale ends May 17 at 11:59 p.m. PDT. You can pick up the DLC on the iOS App Store for $4.99 - here.